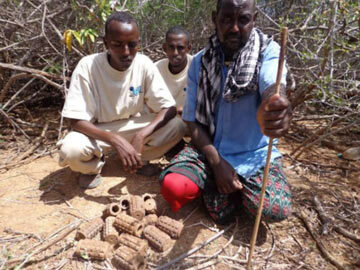 In Somalia, TDI is trying to deal with the expectation of payment for information relating to DAs and UXO. TDI believes that items of UXO are gathered by the local community and hoarded in the belief that they will receive payment for giving them to TDI or other mine action organisations. TDI has been working closely within the communities to encourage them to report the whereabouts of UXO and we maintain a policy of not paying for such information. One of TDI’s EOD Supervisors, William Tswatswa, was shown a cache of munitions in a villagers’ home near Abore. The cache had been in his hut for a decade and included two Chinese stick grenades, an RG-4 hand grenade, two rocket propelled grenades, and 35 homemade electrical detonators. The man said he had collected the items because he had been told that someone would pay for them. Since no one had shown any interest in the cache for over 10 years the villager was happy to give the items to TDI and now understands the risk it posed to his family.